Hungry? Grab some cookies! Enjoy Cookie smash for hours of fun! Cookie smash is a wonderful and addictive match 3 game for all ages. Match and collect colourful and mouth watering candy and pasrty to enjoy the tasty delight! 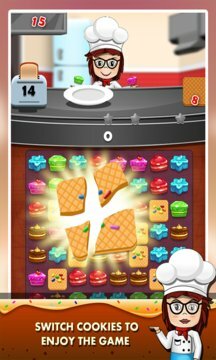 Cookie smash : Cake Jam game will entertain you with its diverse game levels. 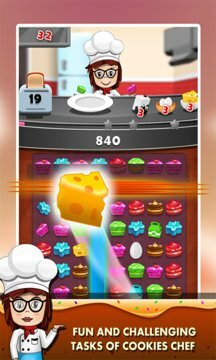 Be ready to swap colourful and tasty cookies and cake and have fun with this match 3 game. •	Soft and crumbled sweet treats of this game is equally addictive, challenging and fun! Sweet and delicious desserts with cookies and pastry in each levels will give you tons of joy and happiness. There are 100 levels of sweet and delicious candy levels. Play through all the wonderful levels of matching and swapping cookies for enormous fun in this cookie jam game. You will love this cake jam game start from the beginning because of its challenging match 3 puzzle levels. Whip your way through all the delicious levels of this cake jam game. Play this sweet and tasty game of candy and pastry for unlimited fun !